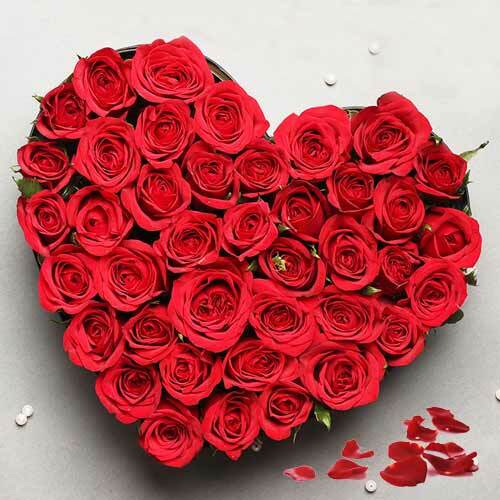 Create magical moments by ordering online this Splendid Heart-shaped Arrangement of 2 Dozen Red Roses for your loved ones and spread your warm feelings into their hearts. 24 Heart Shaped Red Roses Arrangement with Cadburys Celebration pack. 24 Heart Shaped Red Roses Arrangement with Three Colourful Balloons, Teddy Bear. 24 Heart Shaped Red Roses Arrangement with 16 pcs Ferrero Rocher chocolate box. 24 Heart Shaped Red Roses Arrangement with 500grms Assorted Sweets.